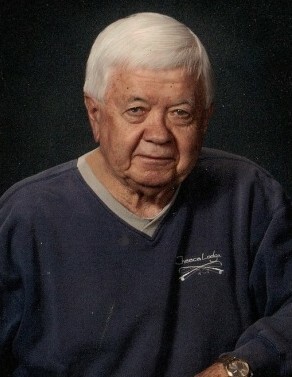 Mr. John Pendleton Hollingsworth (Penny), lovingly known as “Cap,” 86, of Ararat, VA, went to be with the Lord on Monday, February 11, 2019. John was born December 1, 1932, in Surry County, to the late John and Rena Pendleton Hollingsworth. Cap attended Mount Airy High School, graduated from Oak Ridge Military Academy with an associate degree, and served in the Korean War. He then began his career at The North Carolina Department of Transportation, retiring in 1990 as an assistant resident engineer and joined Applied Polymerics as their licensed contractor. Cap was one of a kind, who enjoyed living life to the fullest. His contagious laughter, sense of humor, and positive, gregarious spirit entertained and touched people’s lives in a way that he will never be forgotten. Left to cherish his memories are his partner of 20 years, Janet Epperson; his sons, Chris Hollingsworth and Clark Hollingworth; his stepson and daughter-in-law, Frank and Alisun Boldrini; his stepdaughter, Holly Schneider; his grandsons, Austin Hollingsworth, Caleb France, Zack Smith, and Michael Boldrini; his sister and brother-in-law, Serena and Lloyd Fox; his nephews, John Fox, Trenton Fox, and Billy Fox; his special friend, Mary Branch; and his four-legged boy, Bandit. In addition to his parents, John was preceded in death by his precious daughter, Carrie Pendleton Hollingsworth. A celebration of life service will be held Saturday, February 16, 2019, at 11:00 AM at The Fellowship Church, 5101 Ararat Highway, Ararat, VA, with the Rev. Monte Mitchell and Dr. Jon Cawley officiating. In lieu of flowers, memorials may be made to Dan River Park, P.O. Box 35, Ararat, VA 24053; or The Fellowship Church, 5101 Ararat Highway, Ararat, VA 24053. The family would like to express a special and sincere thank you to his in-home caregiver, Summer Ward, and Mountain Valley Hospice and Palliative Care for their love, passion, and dedication.